With the Democratic and Republican conventions entering normal earth atmosphere, it’s time to get ready to rumble!!!!!!!!!!!!!! Both conventions promise excellent violence in the streets, especially in Cleveland, where a toxic slosh of Trump Brownshirts, anti-Trump protestors and the always blood-thirsty Cleveland PD will meet head-to-head-to-head in “free speech zones,” public parks and perhaps the streets themselves. Now even the cops in Ferguson and Baltimore knew they couldn’t just outright fire live rounds (yet) into the crowds while the cameras were there, and maybe the Clevo cops know it too. So what’s a law enforcement officer interested in violently dispersing a crowd to do? Of course there are your standard tear gas rounds, night stick charges, and rubber bullets but that’s all so… 2015. So why not use a real 21st century weapon, the LRAD. Watch for it in Cleveland, or at a protest near you. The LRAD was first deployed for use in Iraq, and quickly found its way onto Navy and commercial ships sailing amongst Somali pirates. The bad boy is a sound cannon. The LRAD company prefers to label its product a tool to broadcast messages and pain-inducing “deterrent” tones over long distances. The device produces a sound that can be directed in a beam up to 30 degrees wide, and the military-grade LRAD 2000X can transmit at up to 162dB up to 5.5 miles away. Fun fact: A jet engine at 100 feet is 140dB. Sound at 180db will cause tissue damage. But of course the LRAD is non-lethal, so its maker says that anyone within a 100 meters of the device’s sound path will experience extreme pain. The version generally utilized by police departments (the LRAD 500X) is designed for short bursts of directed sound that cause severe headaches in anyone within a 300 meter range. Anyone within 15 meters of the device’s audio path can experience permanent hearing loss. Permanent hearing loss begins at 130dB, and if the device is turned up to 140dB, anyone within its path would not only suffer hearing loss, they could potentially lose their balance and be unable to move out of the path of the audio. So basically, put one of these on a truck and you can clear out a street pretty effectively. And the great thing about such a handy First Amendment-denying tool is that it is indiscriminate. It blasts the breath out of unruly hippies, legitimate journalists, peaceful protesters, happy tourists on the sidewalk, just everybody equally. Sorry about those who were exercising their Constitutional right to protest, because NOW HEAR THIS MOTHERF*CKERS! 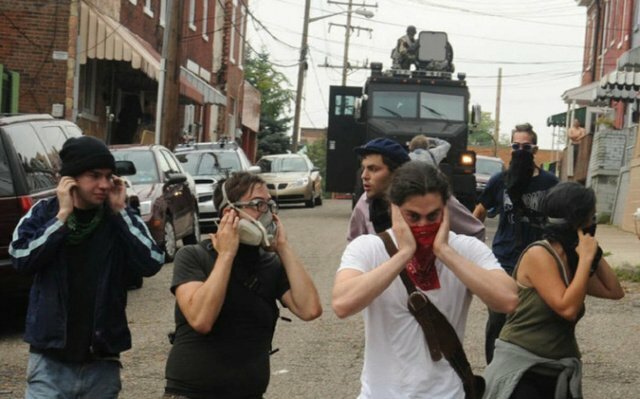 The LRAD device has been used on several occasions against activists in the U.S. The first documented was in Pittsburgh during the G-20 summit in 2009. The Pittsburgh police used it again following the Super Bowl in 2011. The LRAD was used against Occupy protesters in Oakland and New York. New York brought their LRADs out again for the Black Lives Matter marches. 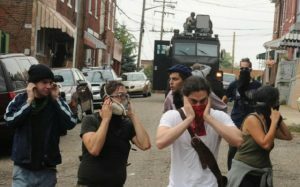 One Pittsburgh protester sued, saying the LRAD used against her made fluid leak out of her ear, and produced dizziness, nausea, and headaches. The city ultimately settled the suit for $72,000. Make no mistake here: this is a weapon of war, developed for the battlefield, that is now being used on American streets against Americans. BONUS: The LRAD Corporation announced earlier this month that the LRAD RXL model has been recognized as “Best Acoustic Hailing Service” by the Government Security News 2016 Airport, Seaport, Border Security Awards Program. The LRAD DS-60 was named as a finalist in the “Best Mass Notification System” category. Hahahaha. Along with Smith & Wesson M-4 ammunition which was named as a finalist in the “Best Attention Getter System” category. Hmmm, I wonder why the US military doesn’t use this on helicopters when fighting ISIS….. er…wait. …arms manufacturers. nevermind. sheeezusfuckingchrist. As if we didn’t know BEFORE the US invaded Iraq. Trump’s best friend Putin just bought one. Where is Joe McCarthy when you need him? pitch check out the fvilm THE GHOST WRITER. Polanski was way ahead of current events. While the LRAD may be drowning out the protestors, the lapdog media’s silence on the Putin-Trump AC-DC alliance is deafening. Trump has been trying to get in bed with the Russians for over twenty years. He may be only in it for the money, but what if Trump has a grander scheme in mind to unite Russia and the US? Gutting US funding for NATO would the first step, which he advocates. Don’t think those Trump flag wavers have a clue they are voting for a Moscow-Manchurian candidate. At the first anti war protest with Obomber at 1600 Penn. I saw my first LRAD. Hope,Change, Be…? What do the military/cops use to protect their own hearing when they set this off? S’OK for Philly (temporary; Because, DEMexit) millennial ‘mischief-makers’, who are busily herding themselves to their freespeech zones; abjectly non-violently (excepting that to be practiced upon DEM), now that their Judas Goat has headed back to pastural Vermont. It seems entirely lost on these little lambs that their venue of ‘protest’ is the bloody fountain of our freedom, where Independence was declared and Constitution ordained and established for (their) Posterity! Who gets the award for this? Damn, this blows Obomba’s collateral damage estimates to hell.